(1) 76054 on rear for banking assistance. 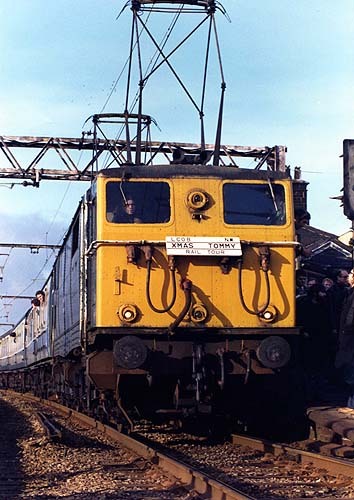 Nick Lawford comments: This train was billed as - and was correct at the time it was advertised - as the last 76 but by the time it ran it was known things were going to carry on. Edge Hill 09/18½ 09/20 ? ? Earlestown ? 09/43 ? ? Acton Bridge 10/02 10/08 ? ? Hartford LNW Jn 10/04 10/12 ? ? Hartford CLC Jn 10/07 10/13 ? ? Greenbank 10/10 10/15 ? ? Knutsford 10/22 10/29 ? ? Deansgate Jn 10/41 10/43 ? ? Skelton Jn 10/43 10/45 ? ? Northenden Jn 10/47½ 10/51 ? ? Edgeley Jn 10/54½ 10/59 ? ? Hadfield 11/48 11/49 ? ?